This 112-page 3.5 x 5 field guide contains straight forward advice for men on how to improve their relationships with women. It covers topics like… • Communicating with a woman • What a woman wants • A woman’s need for security • Improving sexual intimacy. The guide is a positive book that celebrates the differences between men and women while offering effective advice that changes relationships! As a man you react, think, and respond to situations totally different than the woman in your life. Your natural reactions to situations often fall short of expectations and both you and your significant other are left desiring more from your relationship. This book delivers the secrets to understanding a woman’s point of view, and more importantly, provides specific steps and actions that deliver bulletproof results. This is a positive book that celebrates the joy of relationships while teaching helpful guidelines that will improve them. There are 4 divisions in the book; each offers a number of topics that can be read in less than 5 minutes. Armed with this knowledge you can easily meet her needs, creating a dynamic relationship for you both. This is not rocket science, but core knowledge coupled with simple practices that create dramatic results. Now you will never be caught short handed. Simply keep your field guide handy, and in less than 5 minutes you will understand the situation and deliver the goods. It IS simple... if you have the guide. 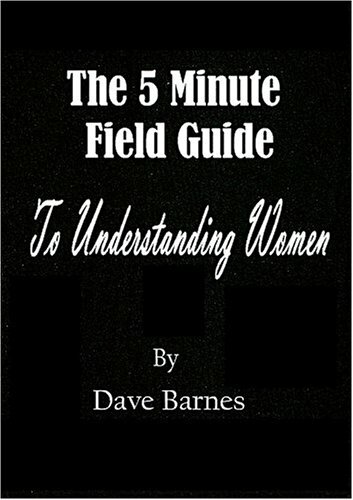 Be the first to write a review of The 5 Minute Field Guide to Understanding Women!